Energy efficiency for too long has only been defined by a lower bill, or financial savings. If you think about it, the industry has essentially been framing the subject as a coupon for your energy bill. And while this isn’t necessarily a “failure,” there’s an opportunity for brands to leverage energy efficiency (and the investment they’re putting in) and make it work harder for them. Especially utilities. In general, people are excited about the energy space right now - the innovation, the efficiencies, the cleaner products, the technology and convenience – but they’re pretty indifferent towards their utility. 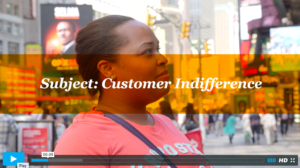 WATCH what customers have to say. Customers are surrounded by an endless sea of content. If you want your message and brand to rise to the top, chances are you are going to have to take a stand. You will have to be relevant, both where the consumer is paying attention and on what actually matters to them. This is the gift of energy efficiency. Whether you know it or not, you have already taken a stand. Whether it was forced, mandated or an outcome of your culture, it really doesn’t matter. If you offer energy efficiency programs or products, this is already proof that you’re taking action for a more sustainable future and a higher quality product… and if your customers join you, they can make an impact too. Allow them to choose. To opt-in. Before we can expect financial savings and lower bills to inspire long-term action, we have to build the customer’s desire to participate. Simply offering rebates and program sign-ups does not paint the picture of taking a stand, nor does it create a long-term desire for energy efficiency. It’s actually just adding another offer to the sea of sales your customer is faced with everyday. Step 1: Inspire customers to WANT to participate. Build awareness of your efforts to offer cleaner, more efficient product and service, and tie that to the benefits and objectives of your customers. Step 2: Deliver the rational offers and rebates that make it easy to purchase and/or participate in these products and services.